Museum collections are legacies of imperial and colonial histories. The dynamics of those histories mean that much Indigenous material heritage from what is currently called Canada is not held in Canadian museums. Much of this material resides in overseas museums, especially in Britain. This geographic distance complicates the ability of Indigenous peoples to access ancestral items. As many Indigenous mentors have instructed myself and my museum colleagues, ancestral items are not objects; they are imbued with animate spirits or potential. Herman Yellow Old Woman (Siksika) expressed this by saying, “When we come here [to the museum] we pray, we talk to these things you call artifacts. To us they’re not artifacts. They’re live; it’s a living thing” (p. 104). Such items are witnesses to and narratives of Indigenous histories as experienced by community members. Contact with them facilitates healing by strengthening the transfer of knowledge across generations and by sparking the narration of community and family histories. Work with historic collections constitutes a special form of historical research with deep meanings in the present. As curator at the Pitt Rivers Museum (PRM) at Oxford since 1998, I have explored ways to make collections accessible to Indigenous communities of origin. This has been part of a broader shift in UK curation, one dependent on external research grants: it costs about $5,000 to move one item from the UK to Canada due to specialist crating, insurance, air freight and courier costs. Museums struggle to meet operational expenses—which don’t include loans, overseas research visits or repatriation costs—making external funding a necessity for access projects. Despite these challenges, UK museums have begun to embrace such work. Online access to photographs and information, 3D digitization, and partnering in online portals to collections have all been part of this work. So has working with Indigenous delegations to UK museums and enhanced loans which include handling opportunities for community members. Such work has begun to improve access and, perhaps more importantly, to develop relationships between museums and Indigenous communities. Access and repatriation take many forms. The PRM collections include the “Great Box,” a nineteenth-century Haida bentwood box by an unknown artist who was one of the great masters of the strict rules of Haida formline. There is no information on how or where it was acquired, but it is known that the Great Box was in General Pitt Rivers’ collection in England by 1877. During a Haida research delegation in 2009, artists were captivated by the box. They wanted to learn from the historic artist, but said they would need to have him in the room and to learn by making an exact replica. We found funding to do that in 2015. Carvers Gwaai Edenshaw and Jaalen Edenshaw made a blank box to exactly the same dimensions as the original, and brought it and their tools to Oxford, where the master artist challenged and taught them. They put their learning into the new box, deliberately replicating every carving stroke down to the direction, depth and angle of the original to understand the master artist’s vision. Gwaai and Jaalen then took the Great Box’s “child” back to Haida Gwaii. 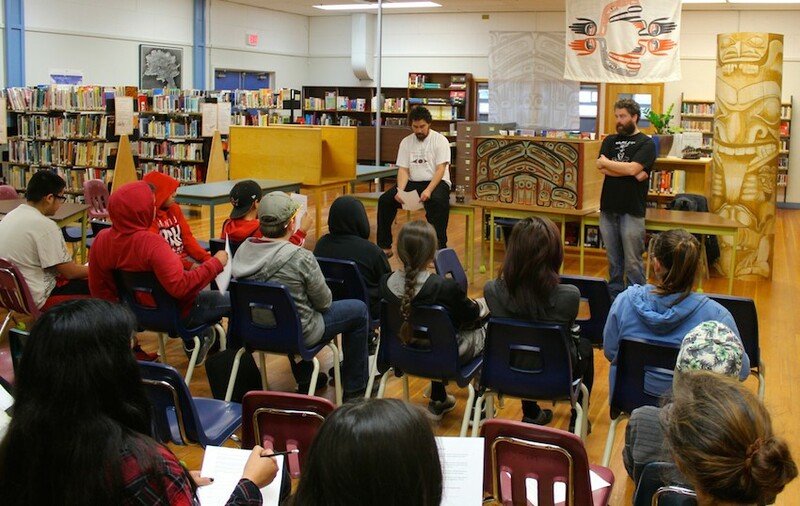 Within a week, it went to the high school in Masset to give a lesson on classic Haida art. 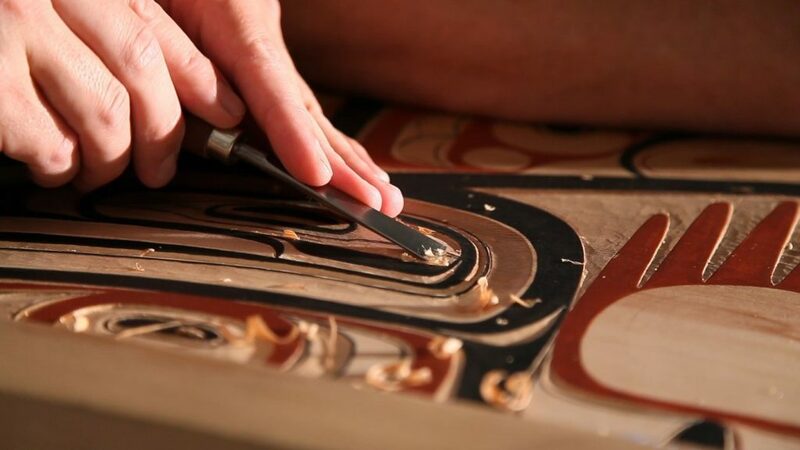 It inspired local artists when exhibited at Saahlinda Naay (the Haida Gwaii Museum) and has been used at the Bill Reid Gallery and the Museum of Vancouver for audiences to consider issues of reconciliation. Most poignantly, it has been used for its traditional purpose, in a potlatch on Haida Gwaii, as a box of treasures, holding a clan chief’s regalia so he could be dressed by his matriarchs as he became chief. Gwaai and Jaalen’s goal for this project was to learn from a master carver ancestor, to take that knowledge home, and to bring a masterpiece back into use in the community. This project also sparked a search for sibling boxes in other museums, in an attempt to put a name to the artist. This has been a process of intense historical research: carvers’ trained eyes and hands see things that historians’ eyes can’t. With further grants, they have located siblings at museums across North America. Tracking down this material is time-consuming, visiting it is costly, museum records about provenance are frustratingly incomplete, and permission to touch boxes has not always been given. Gwaai and Jaalen are doing this work to restore something that collectors did not think worth noting: the name of the artist, his clan, his village, his history of apprenticeship and commissions. That information, and the artistic knowledge the historic artist is sharing with them, contributes to the mending of systems of knowledge and their transmission damaged by colonial processes. The search for this artist also led to consideration of Haida-language terms for the elements of Haida art. Northwest Coast artists largely use English terms for the standard elements of this visual language: formline, ovoid, u-form. These were developed by artist and curator Bill Holm. Reclaiming Haida language terms for these elements—even developing new terms where none were recorded historically—is a powerful strategy of cultural sovereignty. Seeing the Great Box’s child on display at the Museum of Vancouver’s Haida Now! exhibition, with Gwaai’s explanation of these new terms in view of the box, reminded me how potent acts of repatriation are—and how they support other elements of Indigenous culture and well-being. Shifting from “formline” to Sgaajuu “storyline” to describe Haida art makes a world of difference. Figure 3 The Great Box’s child emerging. Photograph by Robert Rapoport. Courtesy Pitt Rivers Museum, University of Oxford. Numerous questions raised by this historical research need more attention. Why are so few academic historians using material evidence? Old Masset produced large quantities of bentwood boxes across the late nineteenth century, supplying huge international demand: how does that align with broad narratives about Indigenous cultural loss or the strategies Indigenous people used to cope with assimilation pressures? What other narratives might it suggest? Nuanced histories of the Haida have been emerging from the exhibitions and detailed catalogues of the Haida Gwaii Museum and its curator Nika Collison: how can academic historians support such work? And why are Indigenous goals such as restoring the names of historic artists seldom shared by academic historians? James Clifford notes that repatriation “establishes Indigenous control over cultural artifacts and thus the possibility of engaging with scientific research on something like equal terms” [Clifford 2004: 18]. Likewise, UNDRIP and the TRC include strong recommendations about access to Indigenous material heritage as an issue of Indigenous sovereignty. However, there is little sovereignty or equality in sight when you’re dealing with customs regulations, visa restrictions, or museum protocols about opening cases so artists can touch. There is as yet no federal funding to support wider-scale communication about where collections are held, community research visits, or repatriation (although Bill C-391 may change that). Indigenous researchers fundraise to visit ancestors in museums. Repatriation costs are paid by the community, not the museum—a galling fact given how so many Indigenous items ended up in museums. Having academic historians ignore key sources for understanding the past isn’t helping, either. By focusing so much on archival sources and excluding material ones, we are limiting the questions we even ask about the past. There is so much that Indigenous heritage collections can help us to understand—about the present as well as the past, and the ways these are entwined. Like the Great Box’s child, there are many creative forms of access and repatriation emerging. All of them have incredible transformative power, for Indigenous and non-Indigenous researchers alike. Laura Peers is Curator, Americas Collections, at the Pitt Rivers Museum and Emeritus Professor of Museum Anthropology at the University of Oxford. She now lives in Lakefield, ON and is an adjunct professor of Anthropology at Trent University (laurapeerscanada@gmail.com). She would like to acknowledge the scholarly and creative contributions of Gwaai Edenshaw and Jaalen Edenshaw to the Great Box project.